If you are a start-up tea company that doesn’t know where to start, Blends For Friends is a one-stop shop that can help you to hit the ground running and make a success of your tea business or venture from the outset. We can also be of great help to existing tea businesses in revamping own label tea ranges and honing products and strategy. Our team of tea industry experts have extensive knowledge of the tea industry and setting up tea businesses of all different types and sizes all over the world and can support you through many aspects of creating and maintaining a successful tea venture, be it for a tea shop, café, restaurant, coffee chain, hotel or tea or herbal infusion retail brand. All of our advice is always tailored to you as a private label tea business. We will look to build a thorough understanding of your business, your ethos, target market, sales and marketing strategies, pricing strategy and long-term goals to ensure that all of the advice we provide is tailored to your business to help you achieve your specific goals. With over 500 ingredients on stock our experienced tea blenders can create most flavour combinations imaginable. As well as tea and herbal infusions, we also work with matcha and powdered blends such as cacao, baobab, moringa and turmeric to name but a few. Each blend will be created from scratch bespoke for your business. Please take a look at the page ’Loose Leaf Tea Blends’ for further details. When designing your own brand tea blend range we will ensure that it is perfect for your brand and your customer demographic. We will ensure the blend range is of an appropriate size, price and that it ‘ticks all the boxes’ across the range in terms of commercially popular tea flavours and types. Once we have created your bespoke tea blends, we can pack them into various catering/wholesale or retail packing formats in our SALSA accredited factory: loose leaf, pyramid tea bags, enveloped tea bags or single serve matcha stick packs. We will assist you in finalising your product designs through sourcing appropriate packaging materials (either branded/white label or off-the-shelf), advising on both practicalities and costs as well as pointing you in the direction of trusted suppliers for various packaging types. Our expert in food industry legal compliance will review your labelling designs and content to ensure compliance with current EU labelling legislation or look into other requirements required for exporting tea and herbal infusions into your markets of choice. We will support you in putting together your price list. We can also provide guidance touching on routes to market, trade fairs, logistics, marketing, funding and tea industry trends. In addition to creating the perfect product range for your business, we can provide training to you and your team to ensure that you have sufficient general tea knowledge and knowledge of your own product range to pitch your products and answer customer queries with confidence. 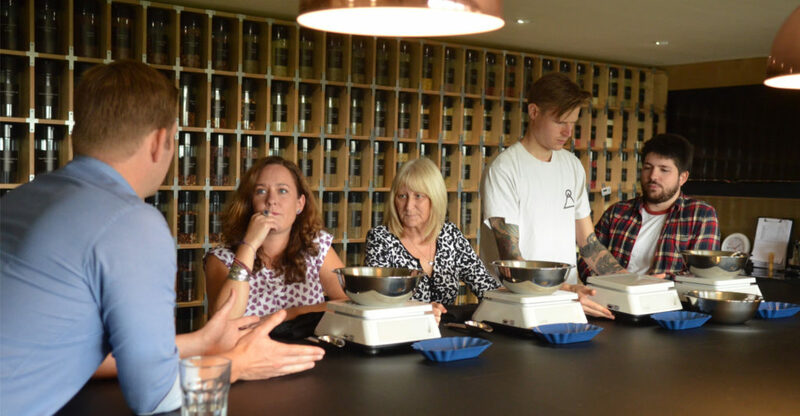 For individuals looking to improve their tea knowledge, we also offer tea tasting events and classes. We also work with various world famous global tea brands to ensure that their tea blenders are creating consistent blends from batch to batch. Alex Probyn, our managing director, is one of very few fully trained Master Tea Blenders. You can read more about his background and qualifications here. If you would like to understand more about our tea consultancy service then please email us at support@blendsforfriends.com or call us on 01732 760808 where we will be delighted to help you.